Tenor saxophonist Lin Halliday achieved an unusual career profile in jazz. In an era where young players have often been thrust into the recording studio before they were fully equipped for the task, Halliday did not make his debut album as a leader until he was 55. He went on to make several well-regarded discs in this late flowering, and established a deserved reputation as an expressive interpreter of both uptempo tunes and ballads in a classic hard bop style which owed much to the influence of Sonny Rollins. Halliday was born in the small town of De Queen, but was brought up in Little Rock, where he began to play saxophone and clarinet in school. He began playing professionally after moving to Los Angeles, notably with saxophonist Joe Maini and in jam sessions. 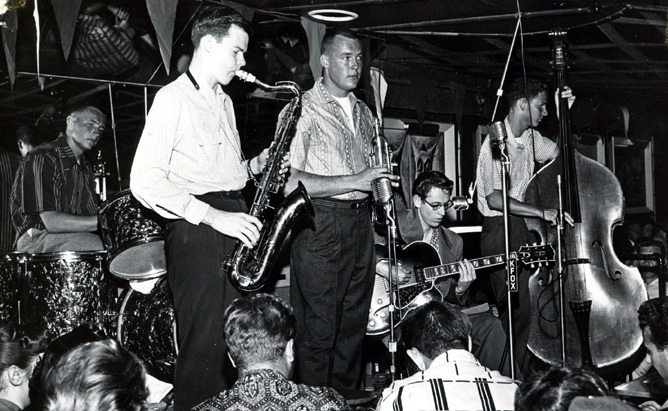 He spent several years in California, then moved to Wisconsin, where he concentrated on developing his saxophone playing in private before relocating to New York in 1958. His first major breakthrough seemed likely when he replaced Wayne Shorter in the Maynard Ferguson Orchestra at Birdland. He played with bands led by drummers Louis Bellson and Philly Joe Jones in the early 1960s, but subsequently had his cabaret card withdrawn, and was unable to work in clubs in New York as a consequence. After a peripatetic phase which took him to Arkansas and then California, he settled with his family in Nashville in 1966. He played in local clubs and worked as a studio musician until 1978, when a serious injury to his knees saw him confined to bed for a lengthy period of recuperation. He moved his family to Chicago in 1980, where he became a staple attraction at a number of the citys jazz clubs, including the Green Mill, the Bop Shop, Joe Segals Jazz Showcase and the Get Me High Lounge. He played on an album under the leadership of trumpeter Brad Goode in 1988, by which time his direct, expressive, occasionally rather sentimental tenor playing had won him many admirers on the Chicago jazz scene. One of those admirers was Bob Koester, the founder of the citys most prominent jazz label, Delmark Records. Koester produced Hallidays debut record, the aptly named Delayed Exposure, in 1991. It revealed a player with a full, rich tone, a refined melodic sense, and a sure grip of bop harmony. He took advantage of this late opportunity, and went on to record two more albums in a similar vein, East of the Sun (1991) and Where Or When (1993), working in tandem with saxophonist and trumpeter Ira Sullivan on each occasion. Halliday was also prominently featured on Stablemates (1995), an album in which he partnered the rather younger Chicago tenor saxophonist, Eric Alexander. He is survived by his daughters Laura MacMahon and Jennifer Halliday, and a grandson, Brady Duncan.